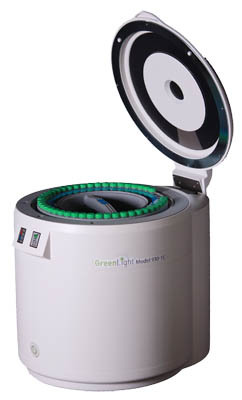 The GreenLight 930 is capable of calculating live aerobic bacteria loads of 24 different samples in as little as 45 minutes. The Model 930 uses the APCheck vial with its integral sensor chemistry and automates aerobic bacterial measurements using a 24 position carousel system. The powerful GreenLight software allows uninterrupted addition of new tests while others are already in progress. Vials and carousels are individually and uniquely barcoded to ensure accurate recording of results. The results are recorded in a format that meets Good Laboratory Practices 40 CFR part 160 “EPA” and 21 CFR part 58 “FDA” requirements.